AIF is the collective voice of businesses from every corner of Florida involved in a multitude of industries fueling our economy. During the legislative session, we are proud to stand up for the issues relevant to our members and work to create a business-friendly climate to benefit our state. Each year, Florida’s business community faces a variety of tough issues. This publication highlights our legislative priorities. It is distributed to all 160 members of the Florida Legislature, the Florida Cabinet, the agency heads of the executive branch and AIF membership. 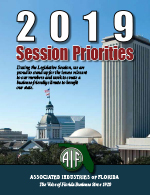 The issues laid out in great detail within this publication summarize the guiding principles which shape AIF’s legislative positions and are what AIF’s Lobby Team will work diligently to support, in collaboration with AIF staff and our Board. AIF has long been known as a tireless advocate and powerful ally for the business community. AIF's Session Priorities publications are available here in Adobe PDF format. You may also search AIF's extensive archives using the search function located in the menu bar.